People will say they hate to burst your bubble, but these kids want to see them pop -- in their classroom, and in zero gravity. The dancing orbs of air -- wrapped in the thin film of chocolate milk or hot tub water or, in this case, dish soap -- are the focus of study for fifth-graders at The PEAK School. With their teacher Kaci Heins, who has a special interest in space science, they have designed an experiment that tests the surface tension of bubbles in the normal gravity here on Earth and in the microgravity of space. More than that, they've got the support of NASA in answering their basic questions: How long do bubbles last here before popping, and how long do they last in space? Put another way, how does change in gravity affect the surface tension, and duration, of bubbles? The first question is something the students are testing right here and now. The second question will be answered through a unique opportunity that Heins and company secured when their bubbles proposal was accepted for testing during NASA's Teaching from Space Flight Week this summer. Only Heins gets to blow bubbles on the flight in late June, but the students are having plenty of fun gathering control data. 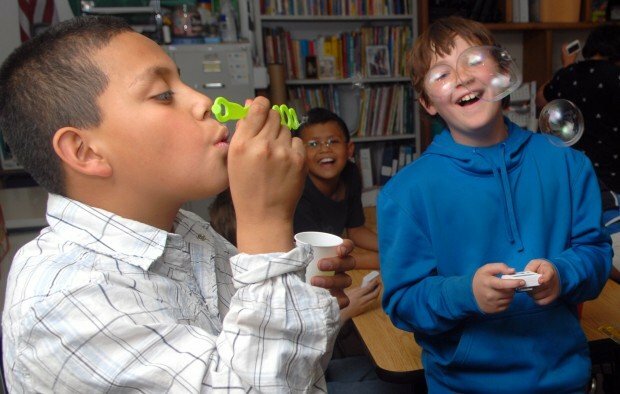 Using toy guns that automate the bubble-blowing process and old-fashioned plastic wands, the students made bubbles, then used stopwatches, rulers and video cameras to measure what characteristics they could about bubble behavior. Bubbles are, after all, a fleeting and delicate thing. "It popped!" came a cheer in Bubble Command Thursday. "Poppity-pop-pop!" The bubbles don't go much farther than a few feet, but the spirit of science is far and wide. Heins, who last year went to NASA's Space Academy for Educators, connected with fellow space camp teachers to get a team together that could test student-designed experiments this summer in the "vomit comet" -- NASA's DC-9 jet, which simulates weightlessness by climbing high and then dropping straight down, giving passengers about 30 seconds of free fall. The PEAK team holds Internet video conferences with a classroom in Atlanta that is working on the same experiment. Dylan Langan had a revelation during Thursday's bubbles session. "I figured out that the higher the bubble goes, the more pressure put on it and the easier it pops," he said. As classmate Chesney Isaac blew a bubble into being, she pointed the wand upward. The northward-bound bubble was brief. "See, more pressure is pushing it up," Dylan said. Sometimes, the simple fun of bubbles got the better of students' attention, as they chased and herded bubbles without their measurement tools at hand. Sometimes they just poked them. At Jazmin Rodriguez' table, the students noted that the iridescent swirls slid down and faded before the bubbles burst. They also said a more concentrated soap mixture made hardier bubbles. "Soap is a more stretchier substance," she said. "When they're bigger they go down slower," said Sam Hodsden, reasoning that bigger bubbles encounter more friction. "When they're smaller they go down faster." Heins said her students are working like real engineers, using scientific method at a depth much greater than most elementary-school students. They've not only got the NASA seal, but are getting help from local astronomy educator and database professional Jonathan Wilkendorf, who works at Lowell Observatory and will help the students crunch their numbers, and technical advising from Robert Bohlin from the National Weather Service office in Bellemont. In addition to the students in Atlanta, the PEAK students are aligned with a classroom in New Jersey and students at nearby Mount Elden Middle School. 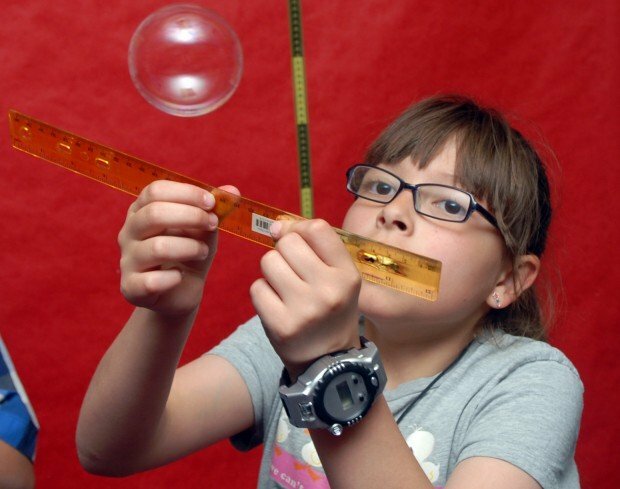 The MEMS students, with teacher Beth Sanborn, are studying bubble behavior as well, but at an eighth-grade level.